Robyn sent us an email to share the gorgeous card she has created. Great work Robyn. 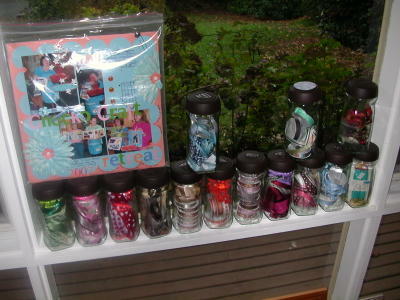 Recently I was a lucky Fiskars blog reader and won a rak, thank you Fiskars for the opportunities you have for us crafters. I received some Fiskars Texture plates, and set about trying them out in my cuttlebug, for this card I used the braids texture plate, which I used some ink on, rub your inkpad over it to get this effect. 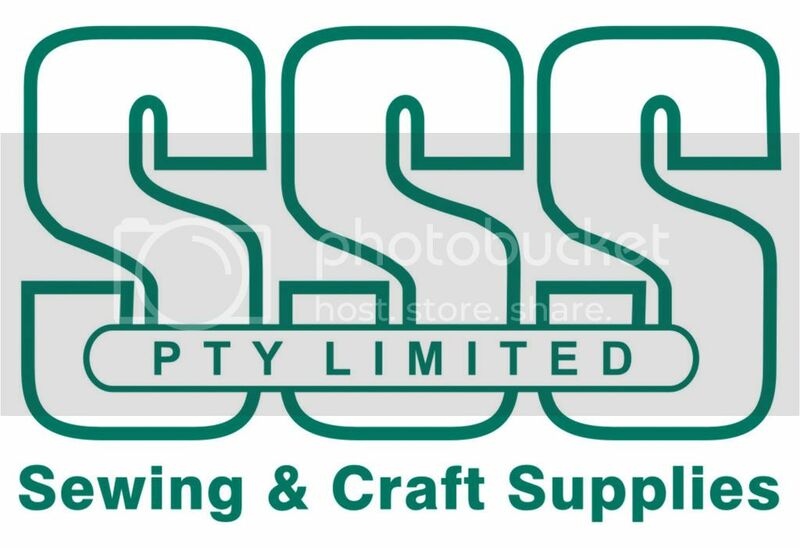 Other items I used on my card included my Seal of Approval squeeze punch, some Cloud 9 paper and some Cloud 9 vellum flowers. One of our Victorian demonstrators Trish, shares her scrap space with us today. 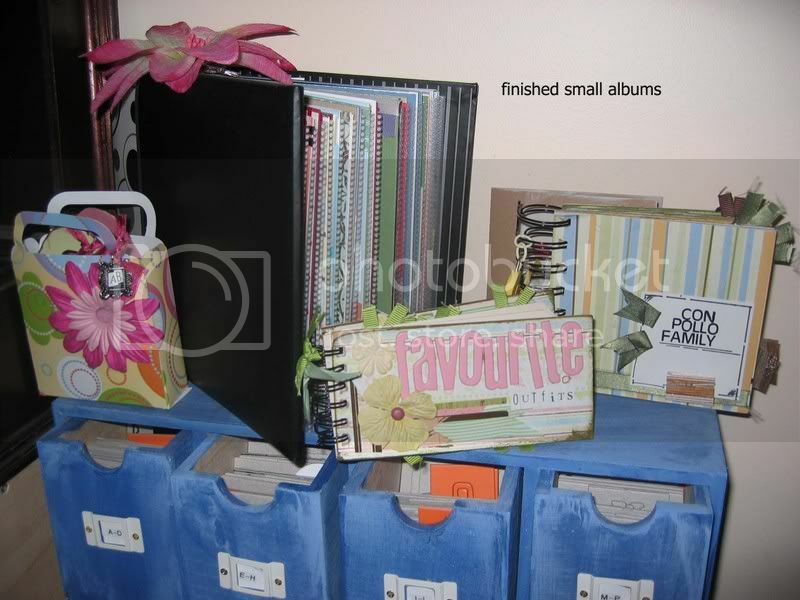 I run a scrapbooking business from the "shed" so its set up a little differently. The sky lights provide wonderful natural light. I have a split system to cope with the Melbourne weather. 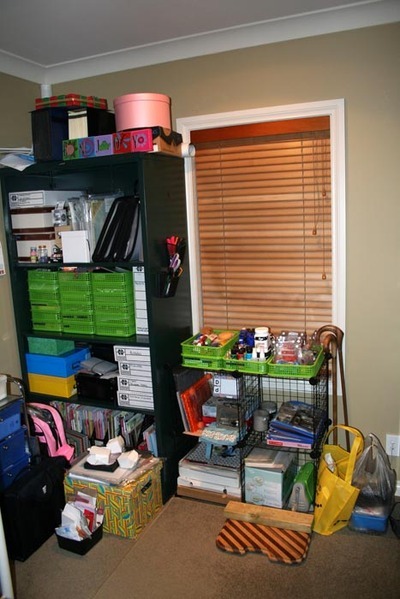 All my stuff is on the create wall and in the book cases below. The space is quite big I can fit 5 friends in for a crop!! 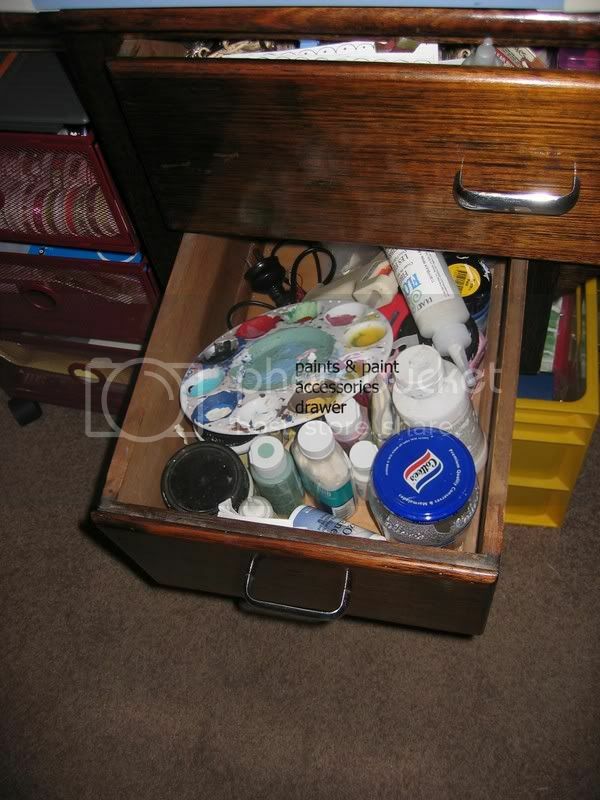 When I started scrapping, all my stuff fitted into one of those underbed storage plastic containers. 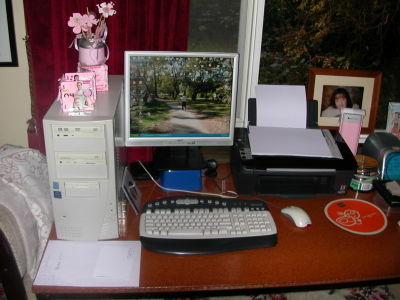 When we built the house we live in, it had a separate office. 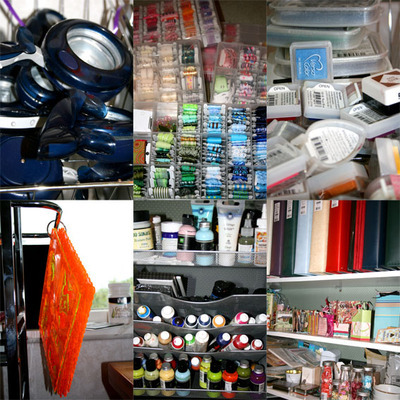 I was under no delusion that would be my scrap space. My DH didnt quite realise the implication of this. LOL. We had been in the house about 4 days when Simon (then 2) went into the office / scraproom and picked up the biggest, fatest, inkiest marker, took the top off and ran. I ran after him but he dropped it nib down right in front of the entrance way. A nasty black mark resulted which you can still see today if you look hard enough. The event meant that Ricky went straight out (after he tried cleaning the blob) and bought a childs gate to go in the doorway. 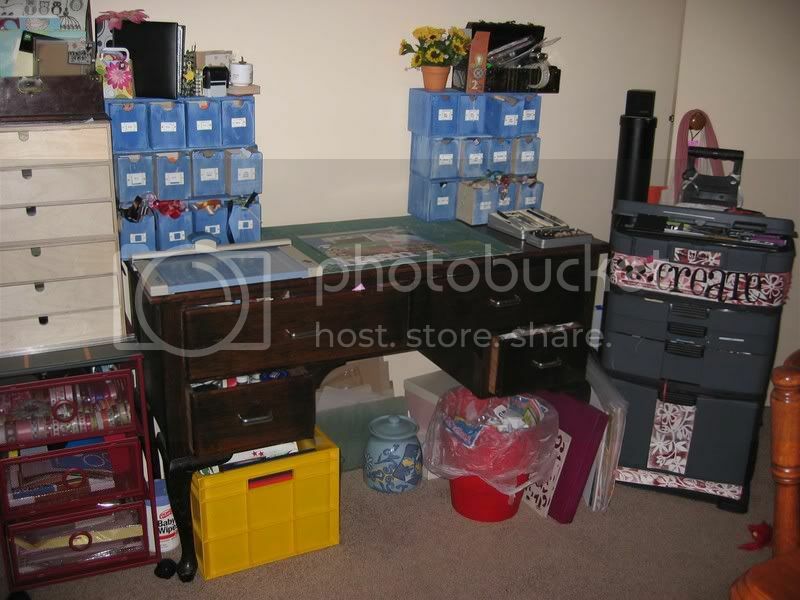 And I think that was the transition of the office into MY SCRAPROOM. LOL. That gate was such a handy thing to have and it trained the kids and visiting kids well. 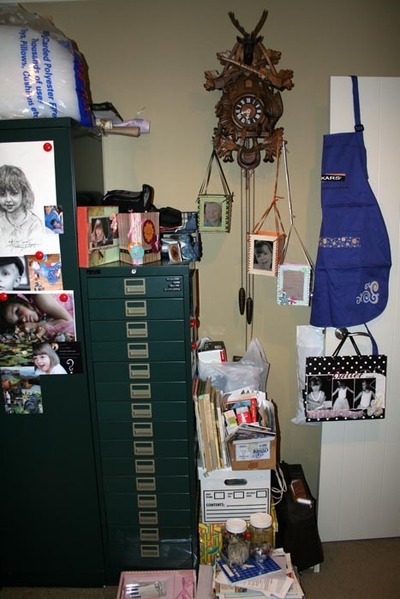 Now I do have a system or should I say systems for storage but half the time I forget what they are! After a recent clean out I instituted 2 things which are working well for me. 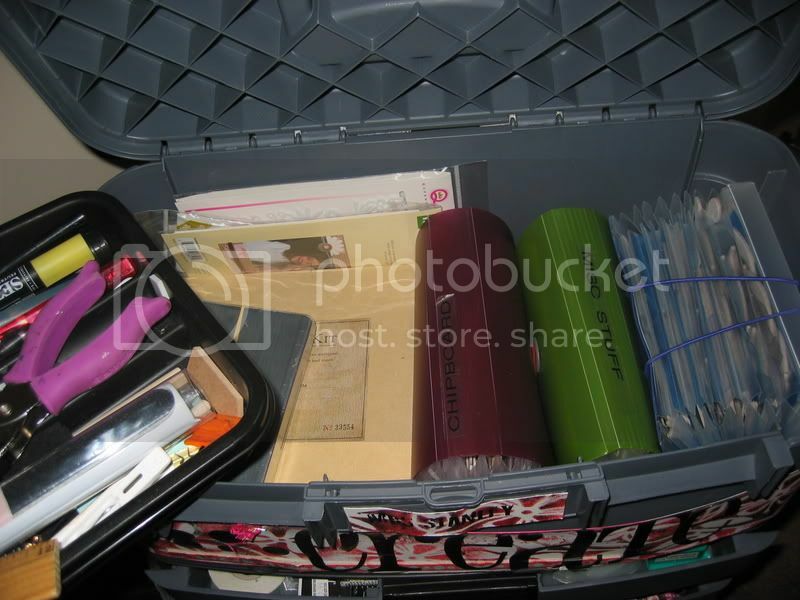 I got a small tote that holds all my pens and tools and swivels. It lives on my desk and everything can be found quickly! 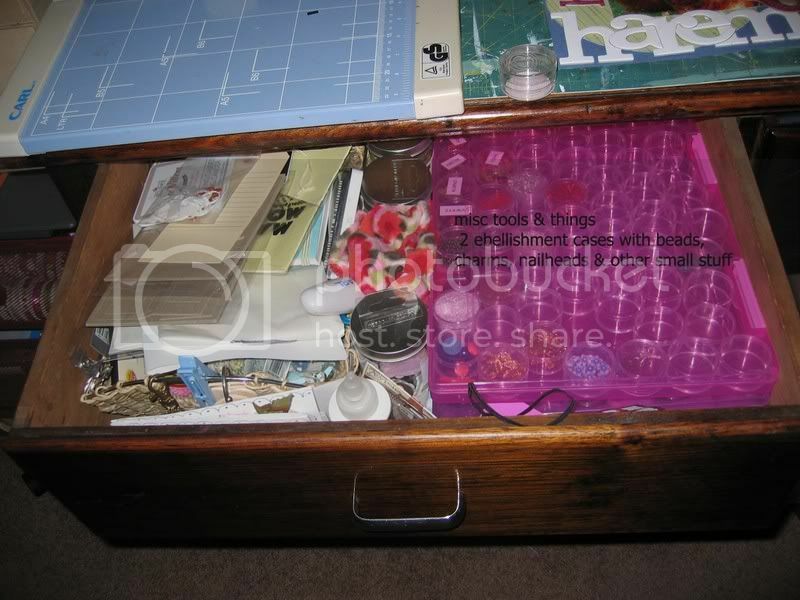 The other thing I did, was borrow from unused glassware from the kitchen and use these for buttons, small bits of ribbon, left over alphas and left over stamped, cut out bits and bobs. 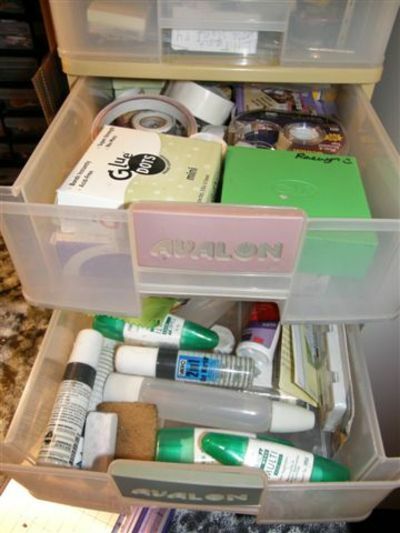 They used to mound up on my desk after layouts but not anymore and whats more I tend to use those containers to find that xtra thing I need for a current layout! 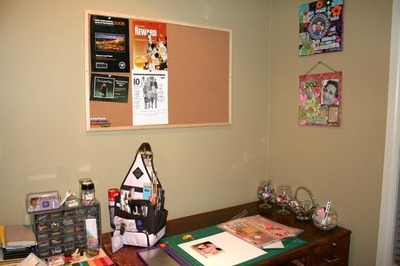 Oh and I just put a corkboard up so I can pin inspiration and stuff to. 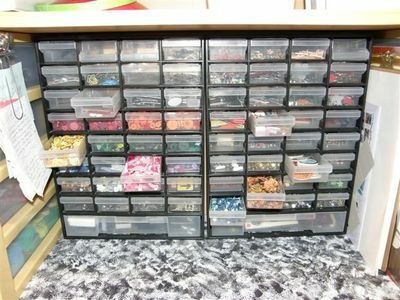 My basic storage are metal cabinets (one with doors and one without) and a 12x12 metal drawer set (cardstock). 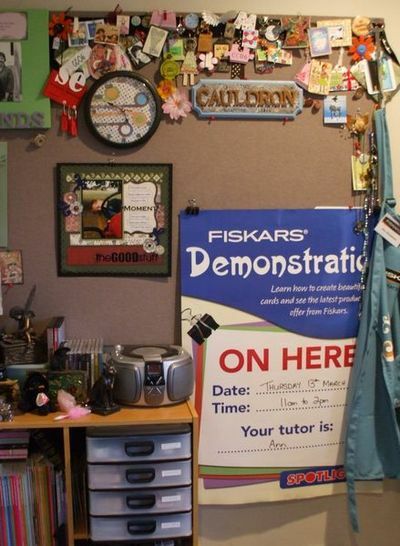 I still have a lot of stuff in this room which needs a home elsewhere and it will happen one day! 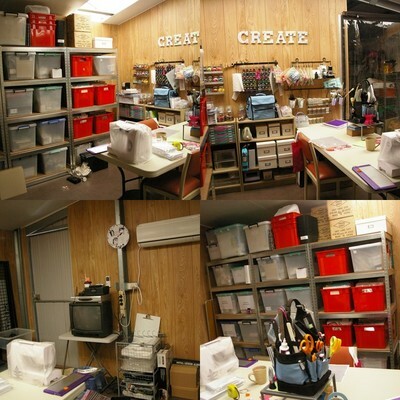 I love my scrap space, it is my creative zone. 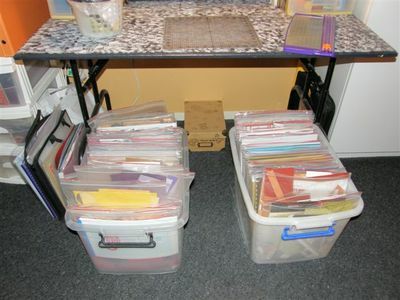 Well, when i started scrapping all those years ago - wow it was in 2001! i only scrapped a little so the dining room table was my space. 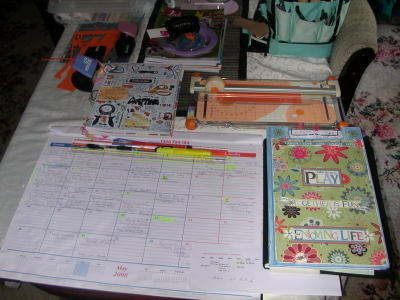 It worked well until the obsession kicked in and at my scrapping peak lol- when i was scrapping heaps for mags etc- and no-one ate on the dining room table for 6 months lol! 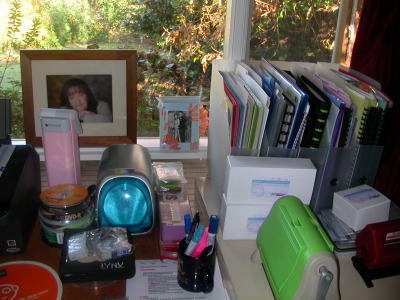 Then A bought a desk and moved things around- which is where i have been since. 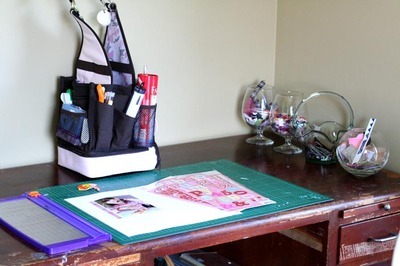 It is a space next to the dining table and you see it as you come in the door- not good when it is a mess. This is it all tidied and ready for me to scrap on. 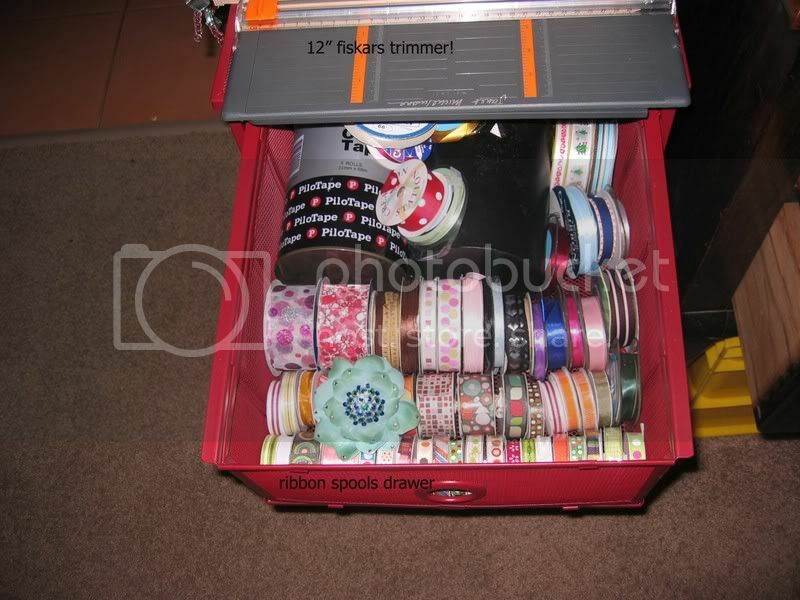 just have to move that lap top and i am good to go :) The 2 smaller pink tins ( picked these up painted with those flowers on at a garage sale for $2 - love a bargain.. anyway i digress- these have my pens, glue sticks, paint brushes and kids pencils for school in them. The last big one is my garbage bin! 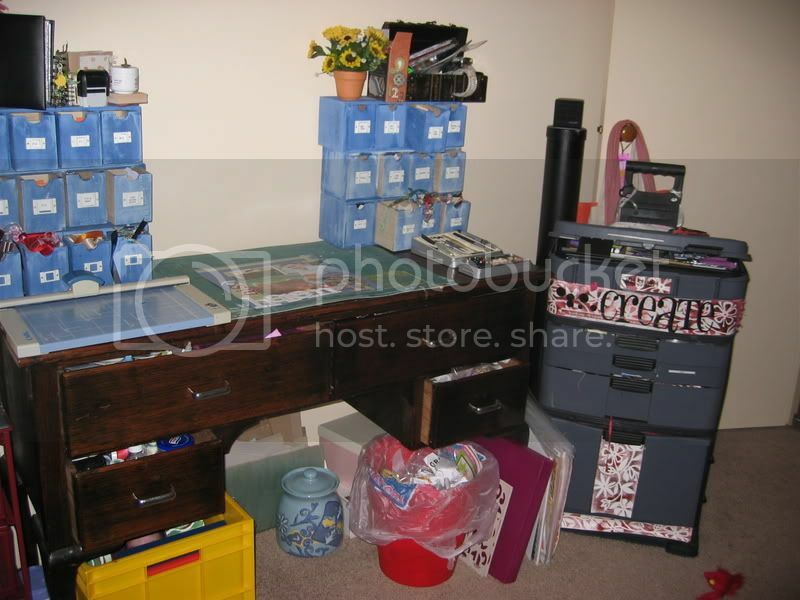 I WILL get around to painting that wooden storage container sometime. 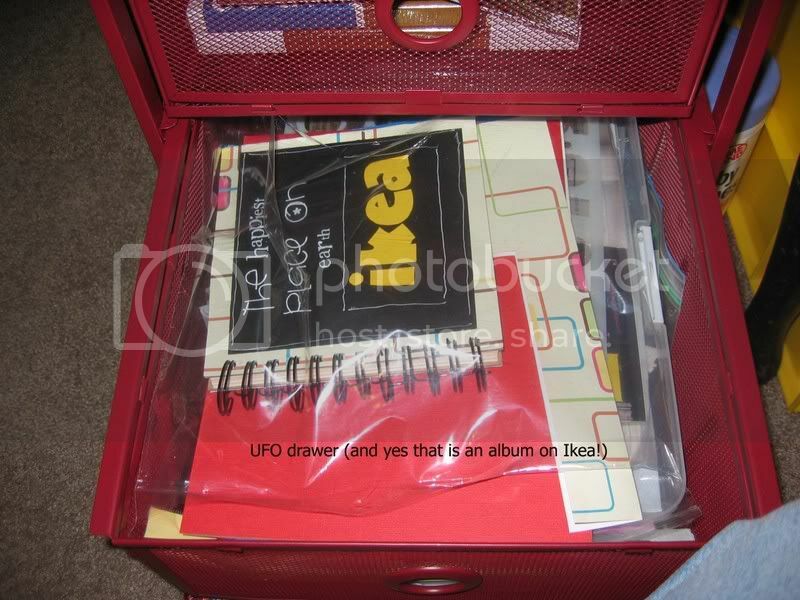 This has stamps, cottons, buttons and brads in it. I love the light her it is bright most of the day. Close up of the baskets- just because i love them - got these from spotlight a while ago- set of three different sizes for 20 bucks- i bought 8 sets in blue, pink and mauve lol- I have the girls school books in the others lined up on the floor in the lounge room. closed and now open- hold your breath- they were neat ONCE!!!!!!! 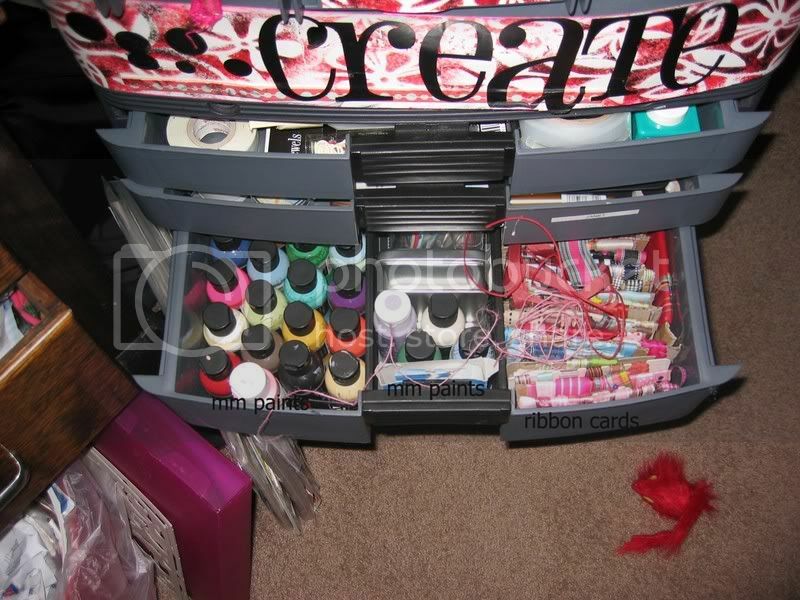 and I just had to share my innovative ribbon storage draw- it makes my life so much easier LOL!!!!! HI. Welcome to my scrap space (or spaces). I'm one of those that scrap at their dining room table. My dear husband hates it. I can't say I blame him. Its always a mess. But needs must. hehehe. When I took this photo I had just finished about 3 LO's in a row, so its kinda messy *grin*, but it gives you an idea of what my poor hubby has to put up with. When I look up, I see Auckland city across the water, so I have a pretty cool view to look at. There are obvious drawbacks with having my stuff stored away from where I'm working. Particularly in winter, brrrrrrrr, but hey, one day it'll be different and I'll look back on these photos and grin. 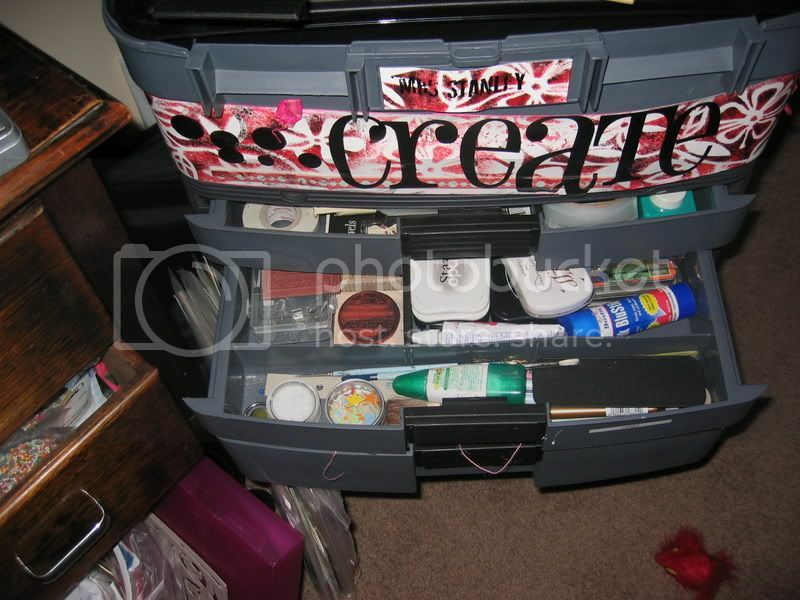 Plus my paints, a bookshelf with some altered projects on it, and my ribbon storage. So thats pretty much it. I don't really have any cool or unique ideas, most of mine have been 'stolen' from other scrappers who have been scrapping longer than me. But it seems to work (except it keeps growing! Eeeeeeeek. LOL) for the moment, and I can sure see some more ideas from the ambassadors here to 'steal'. hehehe. 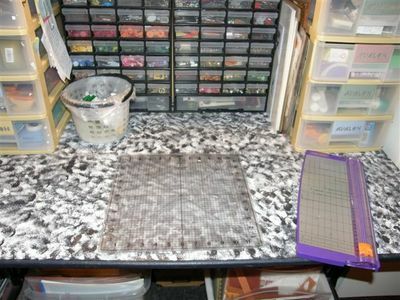 Hi everyone, Ann here and welcome to my piece of heaven....otherwise known as my scraproom. 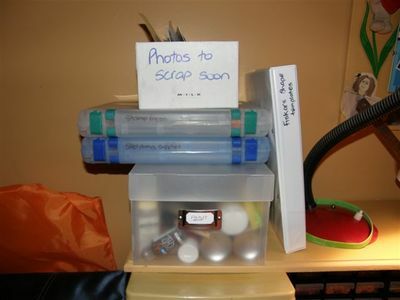 When we moved into our new house three years ago i was very fortunate to get a whole room to myself where i could keep my scrapping supplies, in our previous place i scrapped on the dining room table and all of my supplies fitted into my navigator which just goes to show how much you can accumulate over six years of scrapping. 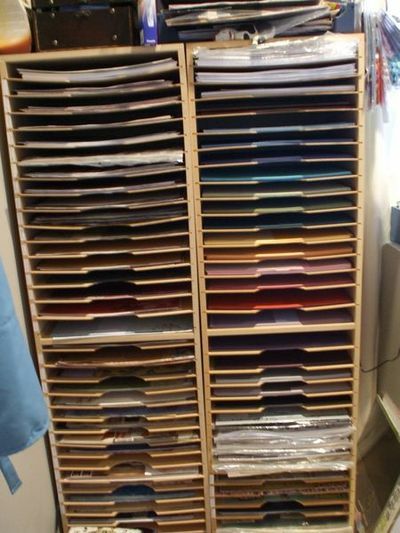 My mother in law works for a kitchen manufacturer and she organised for the huge pin board which is hanging on my wall to be made and both of my fantastic paper racks as well. 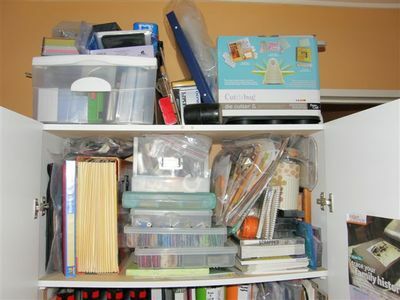 They have 35 shelves in each so there is plenty of space.....although i seem to have filled them up quite nicely! 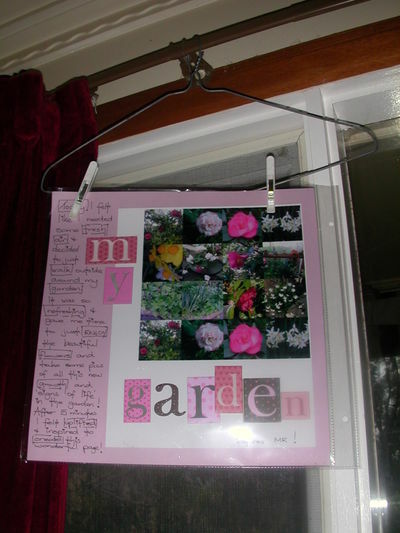 And i can display my latest creations on my pinboard for a while before they go in an album. 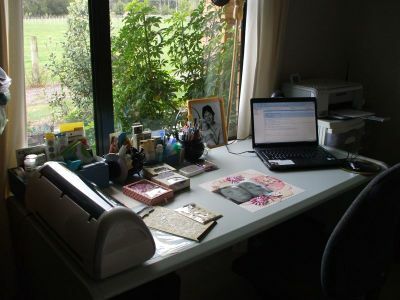 We live in the country so my desk is next to a window that overlooks paddocks, trees and rolling hills, it's very peaceful. 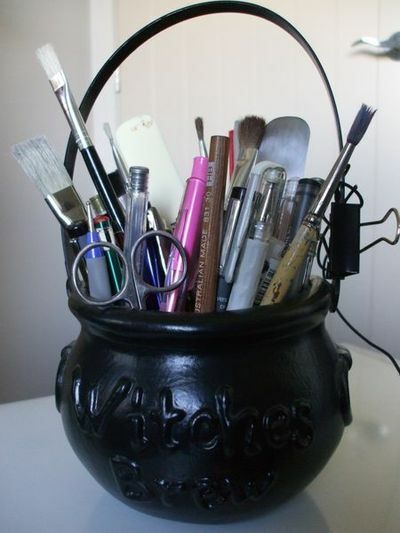 When it comes to storage i keep my pens, paintbrushes etc in a halloween cauldron on my desk. 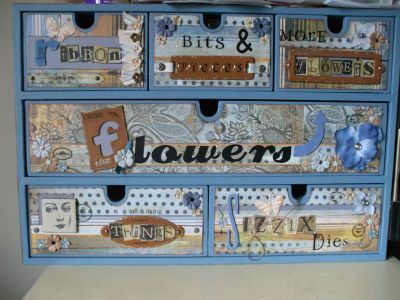 My Prima flowers, ribbons and buttons are stored in an old set of drawers which i have altered with BasicGrey papers. 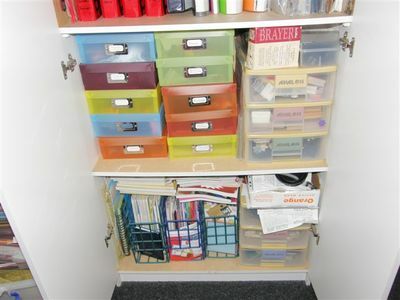 I store my stamps, inks and embossing powders in pull out drawers and we had the wardrobe in my scraproom "modified" with shelves which are currently overflowing with supplies. I haven't included a pic of that.....it's way to scary! So that's my piece of heaven, i hope you enjoyed the tour. Our aussie demonstrator Janet shares her scrapping space with us today. 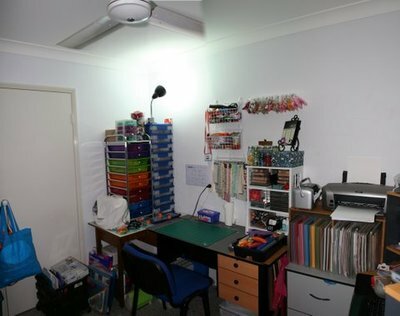 My scrap space - This is the total area of space I have to work in, situated along one wall of our lounge, not far from the computer so I can move easily from one to the other. 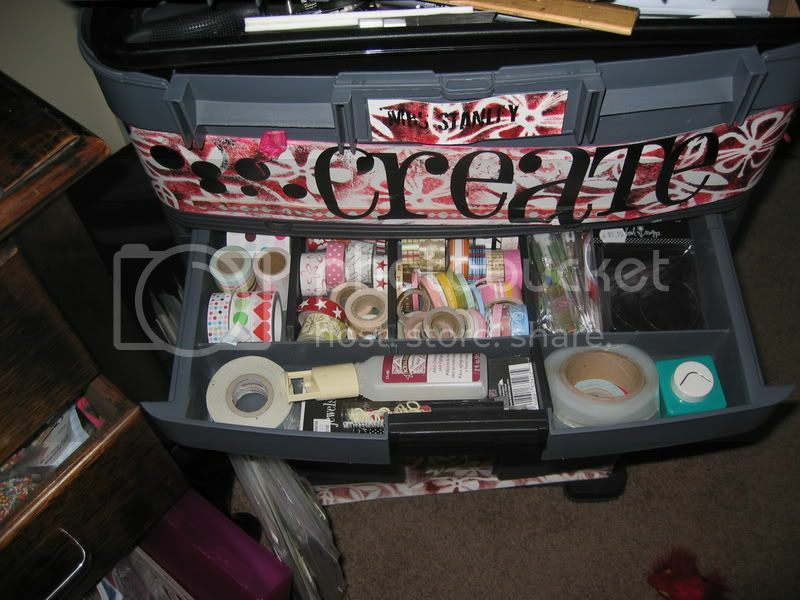 box of painting supplies, sketching supplies, stamp press & Fiskars/Heidi Grace stamps, ribbon jars, tool caddy for rulers, pens, pencils, knives, scissors & glue. 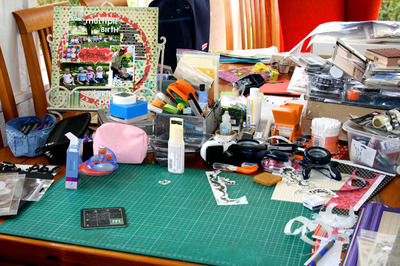 work space, trimmer and rubbish bin (I usually have two rubbish bins one for recyclable stuff and one for non-recyclable stuff). 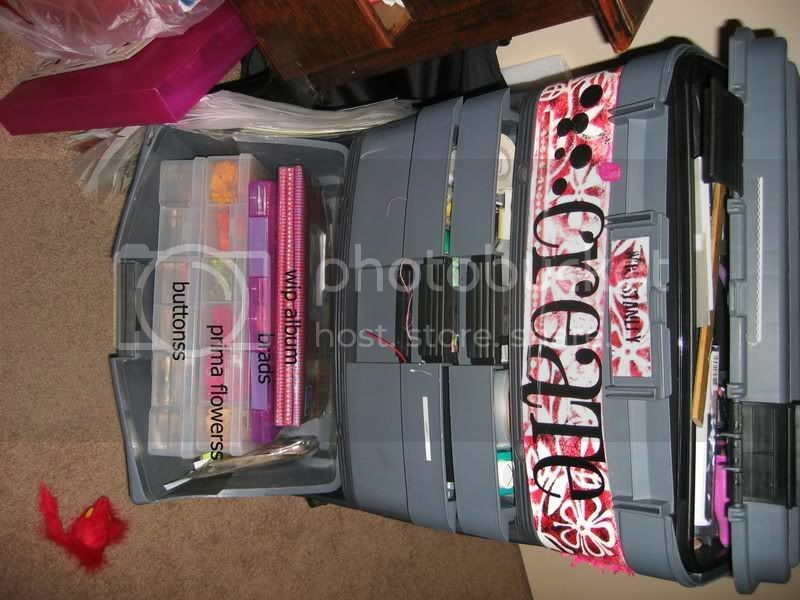 large orange box holds monthly kits, basket of often used tools, tool tote (will be filled when I next go to a crop), Fiskars tote bag containing all the papers & embellishments used only for demos. 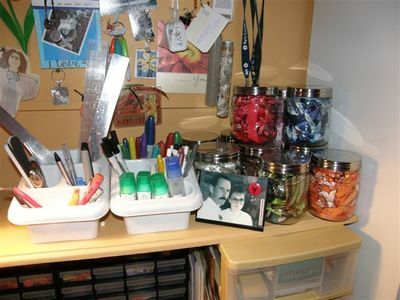 two 45 litre containers with zip lock bags of cardstock, patterned paper, and scraps all separated by colour, also some bags of specific manufacturers papers. 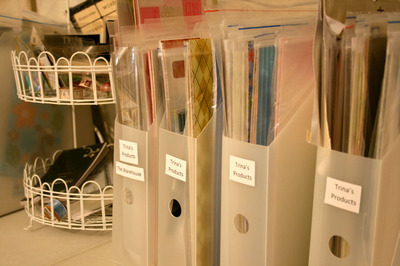 These containers are on wheels so are easy to pull out to find just the right papers/cardstock. 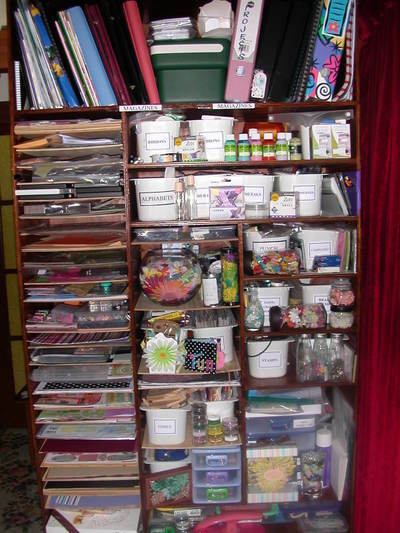 My semi organized scrap cupboard. 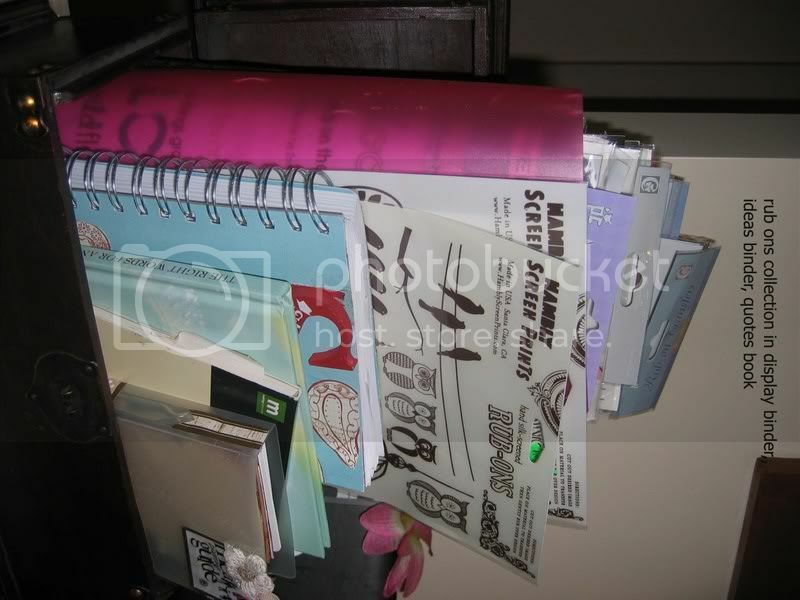 bottom shelf: magazines and idea books. 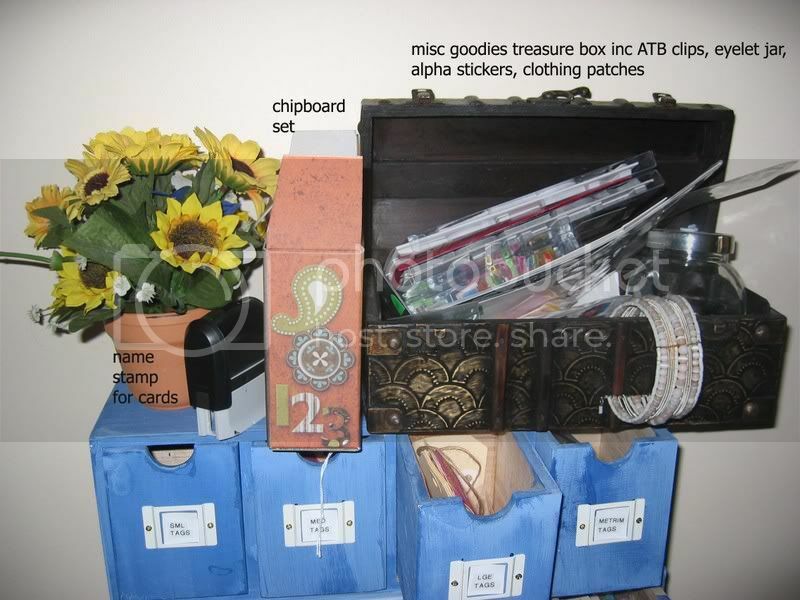 second shelf: larger embellishments eg flowers, bling, frames/tags, boxed chipboard alphas, craft wire etc. 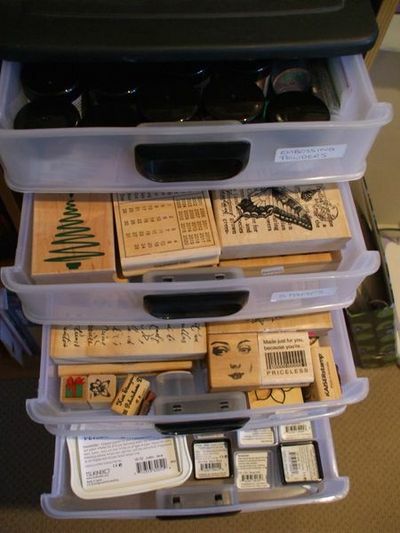 Drawers to the left house more stamps. The red binders house diecuts and stickers in theme order (I am frequently purging these to give away as these are some of my oldest supplies, however do try to recreate these supplies to look new again). 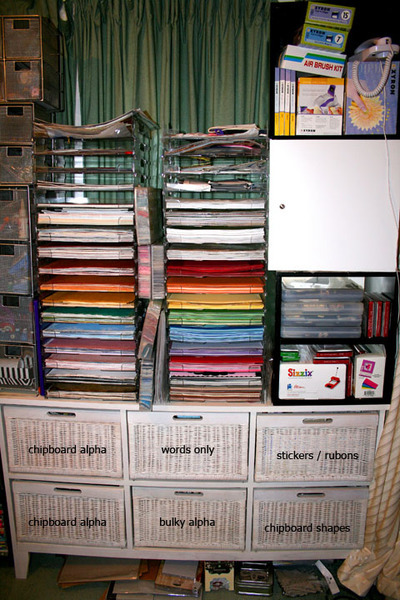 The clearfiles contain all my alpha stickers, rub-on sheets, word/phrases stickers, and chipboard alpha sheets. 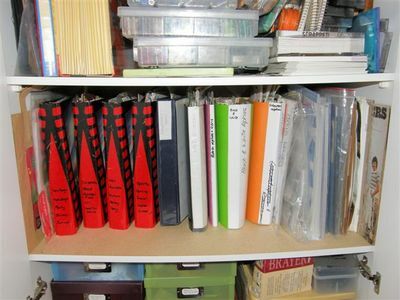 I have also stuffed page protectors on this shelf too. 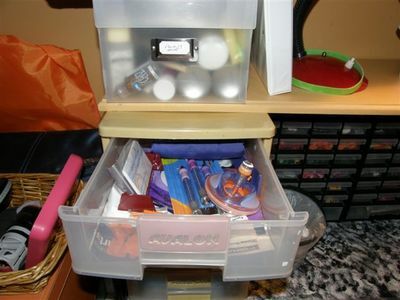 Top of the unit houses a box of stuff to one day use for OTP projects also my Cuttlebug and empty ziplock bags. Top shelf houses a whole bunch of miscellaneous stuff but the big box in the centre houses the rest of my chipboard goodies. Under this box is a huge container of fibres separated by colour (hope fibres come back into vogue one day soon cos I love them)! 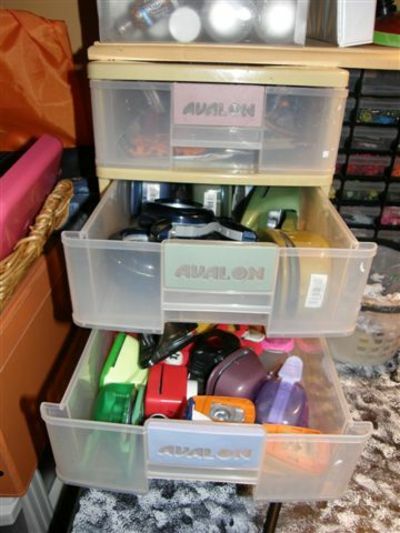 Also a container of alphas eg brads, plastic, mini tag alphas etc all separated into alpha order. 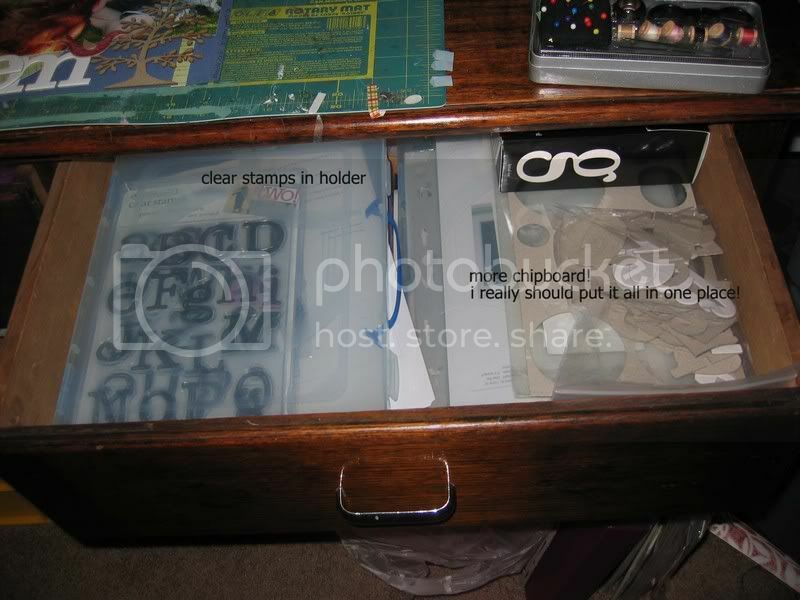 Fiskars drawer for my apron, tools, business cards etc. 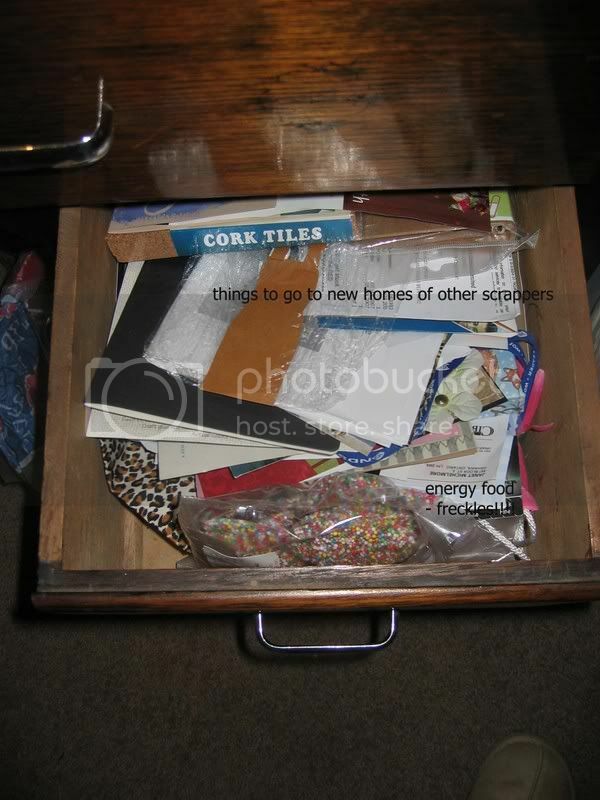 This drawer is emptied into my orange tote if when I go to a demo. 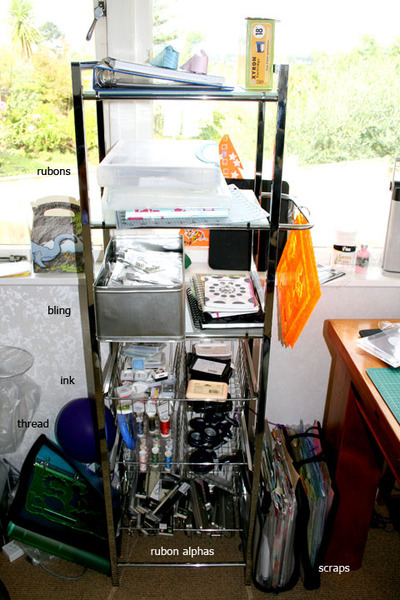 Whilst some of my supplies need more purging/organizing, I am pretty much able to use this small space with no problems. Our home is way too small for a separate room for scrapping and I do like to be amongst the family whilst scrapping. My children are 15yrs and 12yrs old now so I can leave anything out on my desk and know they won't be getting into it. (Have to be more careful if any of the 8 step-grandchildren visit though - they range in age from 9mths to 14yrs)! 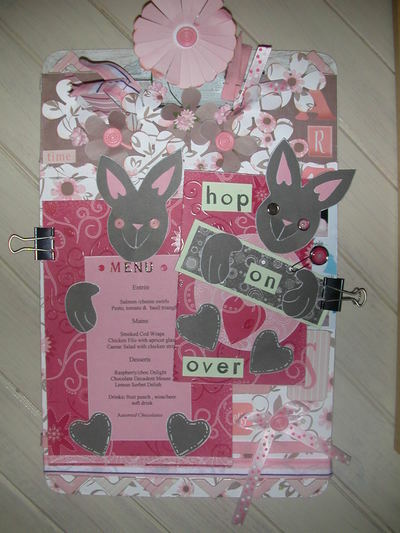 I make up page kits on a very regular basis, to taking to crops, so generally the only layouts I make in my scrap space are those based on forum challenges which have an early deadline. 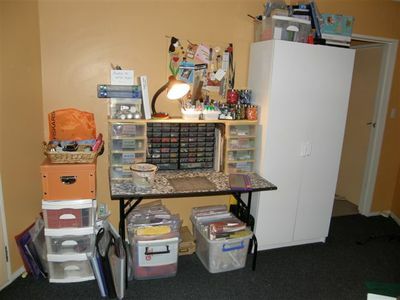 I see from other scrap spaces that I need to make some OTP creations to decorate my scrap space. One day I will make my space more pretty now that you have all inspired me. 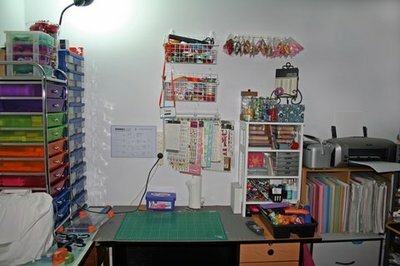 Well I thought that you might like a look into where I spend many hours most days at the moment.....and it's not always playing and creating.....it's often working and planning Events for FISKARS.....so lots of time is spent in this room. It is actually our loungeroom.......but with three boys left home we weren't using this space much as we live mainly in the family room......so I have acquired this room now and gradually over the past few years I'm spreading further around the room.......LOL!